This article is sponsored content brought to you the OrthoED Institute.. Welcome to the 21st century where more general dentists than ever before are treating patients in specialised areas. Dentistry has changed over the past decade due to many factors. The number of registered general dentists in Australia has grown from 14,687 dentists in 2002 to 22,000 in 2018 and combine these statistics with the involvement of health funds and corporate groups and it is making it a difficult space to practise. It has become extremely competitive and general dentists have broadened their skills to fill their appointment books. General dental practices now offer oral surgery, endodontics, prosthodontics, implants, orthodontics and the list goes on. There will always be the need to have specialists and it is important for general dentist to understand his/her boundaries as to which cases can be treated by them and which cases should be referred off to our specialist colleagues. General dentists are supported by their specialist colleagues in many of these areas but one area that still has a cloud hanging over our head is orthodontics. In hindsight, specialist orthodontists should be treating more difficult cases and 75% to 80% of simple cases can be treated by general dentists, given the correct training as is seen in other areas of dentistry. The statistics in America can only alert us to where dentistry is heading in Australia. “The endodontic statistics are clear—only about 25% of the 25 million root canals performed in the United States are completed by endodontists. Endodontists could not possibly do all of the root canals alone. Is the lecturer a specialist in the area he/she is lecturing? How many cases has the lecturer completed in his/her career? Will they teach you risk management? Is there an ongoing mentoring program? Does the program offer training in sound principles or is it based on a gimmicky system? retention, stability and the fate of third molars. The OrthoEd institute now offers a two-year program consisting of eight Dr modules and a two-day staff module. Each module ranges from two-to-three-day programs and are developed and delivered by a local specialist orthodontist with more than 27 years’ clinical experience who has completed over 10,000 cases. The OrthoED model is designed with the general dentist in mind—understanding the need to build confidence. 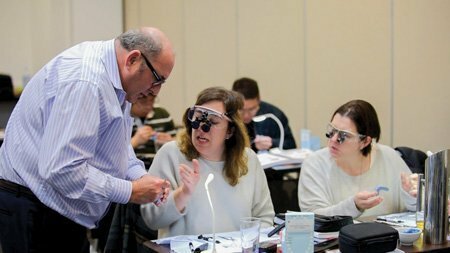 All modules are based on sound orthodontic principles, including risk management strategies, understanding how to implement orthodontics into your practice, knowing which cases not to treat and providing total support and mentoring for all of your cases. For more information about OrthoEd, call 1300 073 427, email info@orthoed.com.au or visit www.orthoed.com.au.